A movie producer, a few years ago, effectively and seriously challenged Christianity, calling into question the Resurrection, which is critical to Christianity. The Resurrection PROVES God accepted Christ's innocent blood sacrifice in full atonement for sins. Many believers advised to ignore this challenge and let it pass. But, I thought this was very very wrong. We should rise to the occasion and use the golden publicity opportunity to strongly testify for God. This means we have to get our thoughts and our evidences and arguments in order. This is good!!! The bodily resurrection of Jesus Christ from the dead is crucial to Christianity. It proves the heavenly Father-God accepted Jesus’ innocent blood sacrifice in total payment for sins and won everlasting life for man. The current reports denying the holy, unmarried life and bodily resurrection from true death, of Jesus Christ are not new. Similar theories have tried and failed. Jury members carefully compare physical evidence and testimony. True Christianity is not a tale; it stands on genuine historical events as documented in the Bible. True Christians will welcome this great chance, and others to sharpen and witness. Some quick thoughts: Another recent affront to Christianity, the “Da Vinci Code” has largely been debunked, the History Channel showing the documentation is phony and a DNA test failed. Decades ago scientists spoke of Ape-Men: Java man, Cro-Magnon Man, Peking Man, etc. They’ve all been debunked and are no longer in textbooks. Piltdown man was in the proud British Museum about 40 years with some 500 books and pamphlets written before Piltdown was proved a forgery. We’ve been told for a 100 years that science shows evolution to be true. But now 10 to 100 millions of Earth species with billion-letter-genetic-codes show this is an exquisitely MADE world. Two Border Patrol agents were recently convicted. Now we learn key evidence was withheld. 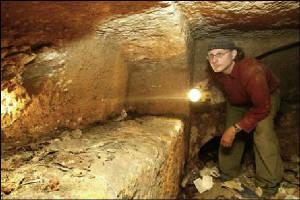 Let’s be real careful to “WAIT AND SEE” about this so-called Jesus’ Family Tomb stuff! Consider other key points: First, the Bible track record checks; the secular expert’s record does not! Most secular experts reject the CREATOR outright and can’t be trusted to speak on God’s works. Modern high tech devices reveal immense mind-boggling intricacy everywhere we look in nature. Estimates for numbers of Earth species are 10 to 100 million with genomes in billions of letters. We are high-tech! Sophisticated codes galore demand a mighty Creator-God. Don’t trust God rejectors! Body, soul and spirit ARE us! Consciousness – just think of it –an absolute marvel! The modern terminology is false, though. The Bible’s right. No! Your God-made SPIRIT autonomously communicates with your SOUL concerning things you might otherwise forget. The Bible says your SPIRIT scans your being and acquires information it needs to recall to you. The Bible is right! Second, the Bible is the 800 pound gorilla. 10,000+ ancient, handwritten Bible texts remain, as manuscripts, in old church service books, or as quotations in writings of churchmen. 99% of NT texts agree to 90%, 90% agree to 97%. “From Genesis the Bible bears witness to one God. Wherever He speaks or acts he is consistent with himself, and with the total revelation concerning Him. The Bible forms one continuous story --the story of humanity in relation to God. The Bible hazards the most unlikely predictions concerning the future, and, when the centuries have brought round the appointed time, records their fulfillment. Without the possibility of collusion, often with centuries between, one writer of Scripture takes up an earlier revelation, adds to it, lays down the pen, and in due time another man moved by the Holy Spirit, and another, and another, add new details till the whole is complete. From beginning to end the Bible testifies to one redemption. The Bible has one great theme--the Person and work of Christ. Finally, these writers, some forty in number, writing through twenty centuries, have produced a perfect harmony of doctrine in progressive unfolding.